Are you struggling to create and sustain empowering habits? Are you struggling to create and maintain empowering habits? Its so important to look at our current habits and see whats empowering us and what isn’t. Habits are consistent routines that get results. If we don’t have routines and rituals in place, no results in our life can grow. What are my current habits/routines/rituals, how do they make me feel? Reflect on negative habits you might have currently and how they are making you feel? What would you like to change? What are some of the good habits I already have, how do they make me feel? What empowering habits would I like to bring into my life? How would they affect me and how would they make me feel? Whats the longterm consequence to myself if I dont create new habits? Whats the longterm benefit to myself if I do? If we can master and control our habits, our life can change. the habits we want to create as this causes momentum and change. How do we maintain new empowering habits? Often we start a new year or time in our life full of excitement and determined that this time things will be different and we will keep to new empowering habits. However, often within a few weeks, our energy is drained and we are back to old ingrained habits that do not serve us or grow us in any way. It takes up to 30 days to create and sustain a new habit. 1-10 – UNBEARABLE First couple of days feels exciting. Then as the newness sets in, it becomes unbearable, painful and doesnt feel like fun. The first ten days are the hardest. 11-20 – UNCOMFORTABLE You become more used to the habit. You start to develop more confidence and feel some benefits of the new empowering habit forming. It still requires discipline and commitment. It can still feel like its easier to revert back to old habits. Stay committed as the more you progress to 21 days, you will become unstoppable. This final part is crucial to maintaining a life long habit. Its where you feel so much more positive about the new habit and associate pleasure with it. Its where life begins to transform as it becomes something that you become rather than are trying to become. If you can get past Day 21, you will begin to really connect with those new empowering feelings and habits and begin to feel unstoppable. Never beat yourself up over not achieving what you intended for that day. Acknowledge where you are now, and honour the space between where you are now and where you want to be. This is the true art of self acceptance. It might take a few attempts to get past the first ten days, even the first 21 days……..its baby steps in the right direction every day. Patience, perseverance and persistence. Change is hard at first, messy in the middle and gorgeous at the end. Keep committing to yourself and promising yourself that you are moving towards your goals and celebrate every step of the way and before you know it, it will be part of who you are and will stay that way forever. How we FEEL is also so important, if we can focus on this as much as possible, this is what we will attract back into our life. Create mood boards and scrapbooks on how you want your life to be. When we can see things visually, it can make such a difference as we are sustaining the emotions around our desire we then begin to attach emotionally to the bigger picture. Why not create a mood board around a particularly aspect of your life that you would like to improve? Begin with one new empowering habit you would like to create, master the 21 days and then focus on something new. What empowering habits could I create? 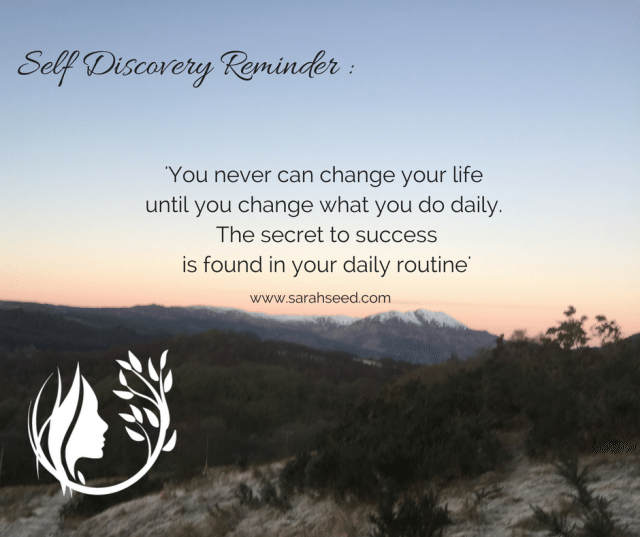 I often get asked what my routines and rituals are, what habits have I created that keep me generally feeling aligned and connected within. Meditation, gratitude journaling, mindfully drinking at least one hot drink (any Mum will appreciate how challenging this can be! ), weekly walks in nature, yoga, reading self development books. You can do this! Make a promise to yourself that your personal development is a priority and that empowering habits will make a incredible difference to your life and watch the magic begin to happen. Great post! I appreciate the way you write the articles.Its so motivating .Its really very important to be confident ,so that we can survive in this competitive world.confidence is everything you need in this world.Thanks for sharing this article.